Fukuoka City is located in an important area as a hub of marine logistics with proximity to Asian ports. Import and export cargo volume with amount of trade has continued to increase. In terms of cargo volume, while China is the largest partner of trade both in import and export, other countries vary in those trends in export and import (see figure 3-1). Import items such as clothing, agricultural and fishery products, and materials come from their manufacturing countries. Aside from vehicles, most export items such as parts and raw materials are for the pre- completion steps in the manufacturing process. 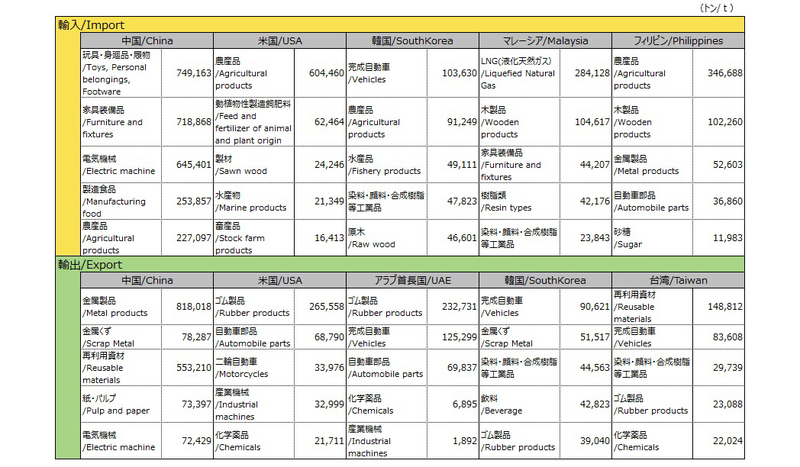 Fukuoka City is playing an important role in the global value chain as seen in (figure 3-2). Source: Port & Harbor Bureau, Fukuoka City. 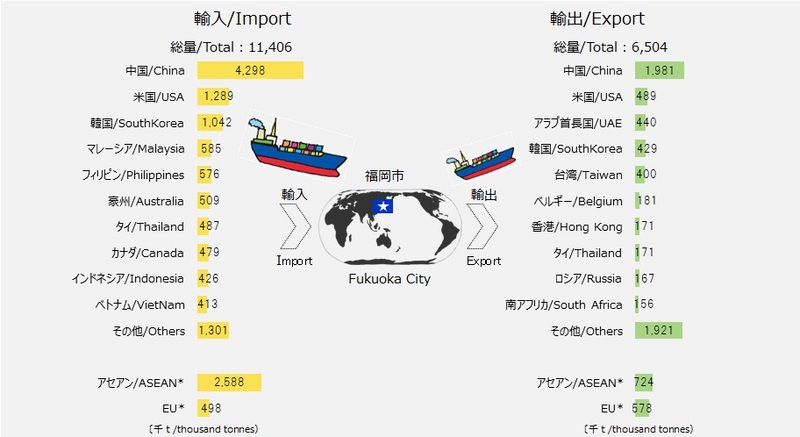 Port of Hakata Yearly Statistics (2013). In terms of gross weight, import volume is approximately 1.7 times as large as export volume. However, in terms of trading value, the situation of export and import is reversed, and export value is approximately 1.8 times as high as import value. The trade surplus has reached more than 800 billion YEN at Hakata port, which indicates that a lot of high-value added items are exported (see figure 3-3). Although only China accounts for a large share of import value, not only China but also Korea account for a large share of export value. Source: Moji Customes, Ministry of Finance Japan (2013). Compared to other ports in Japan, Hakata port ranks only 23rd place in the ranking of trading volume; however, it ranks within the top 10 for trading value. Especially, the share of export in the trading value at Hakata port is large, and it ranks 7th amongst Japanese ports (2nd largest amongst top domestic ports with trading value). The amount of export value for its volume at Hakata port is significantly high. 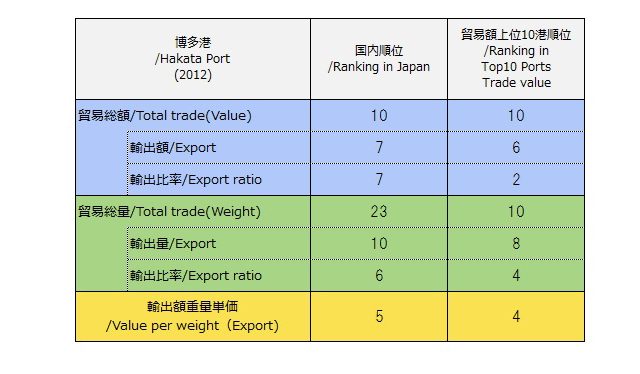 The value per weight at Hakata is higher than Nagoya port, Japan’s top port with export volume, which places Hakata port 5th in the ranking with price per weight unit in Japan (4th amongst top domestic ports with trading value). For reference, in comparison with an overseas port, Seattle port which has the similar size of its hinterland population as Hakata port, total trading value at Hakata port is higher than at Seattle port. (Seattle port ranks 24th in the US trade ranking) Although Hakata port and Seattle port are comparable in export volume, the value per export volume at Hakata port is more than double (see figure 3-4). 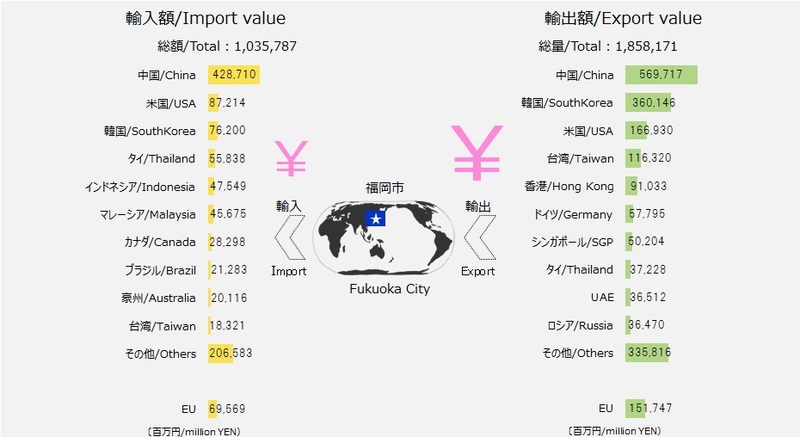 Additionally, while other top 10 trading ports have heavy industrial areas around, Fukuoka City without industrial areas keeps the high amount of export value based on the “added value”. Sources: Ministry of Land, Infrastructure, Transport and Tourism. Trading Value Ranking by Port (2012); American Association of Port Authorities (2013). Note: Trading value is calculated by US$1=108JPY (Bank of Japan Published Exchange Rate on 24 Oct, 2014). In terms of the region of trading partners by trading value, Hakata port deals in both export and import with Asian region much more than with other regions, compared to the domestic average. It shows that the port of Hakata is generating a trade surplus by taking in dynamism of Asian region where the economic growth is continuing (see figure 3-6). The top export items by value to China are Vehicles, Electric machine, and Scientific and optical instruments, while Electric machine, General machinery, and Plastics are the top export items to South Korea (see figure 3-7). Source: Moji Customes, Ministry of Finance Japan. Trade Statistics of Japan (2013). Unlike Asian megacities, Fukuoka City does not have a large-scale accumulation of manufacturing industries, and Hakata port is small in size and on facility aspect compared to other large-scale ports in foreign countries such as China and South Korea; however, the city is generating a large amount of export value supported by domestic and regional added value. Fukuoka City is also a rare place where its seaport is located in the center of city on a global basis, while not many large cities have seaports which can be the marine logistics hub. Hakata port is located in the important place that connects Japan with Asia, and has been prospering as a trading port since early times, as well as a gateway not only for logistics but also for international marine routes. The number of international passengers at Hakata port is the largest in Japan. In recent years, the high-speed logistics between Fukuoka and Shanghai using high-speed roll-on/roll-off ships (RORO ships) has been established. While it takes approximately 7 days from Tokyo Port to Shanghai by cargo ship, a liner from Hakata port that sails to Shanghai only for 28 hours at the quickest is in service, which gives Fukuoka an advantage in speed. To take in dynamism of Asia is the important challenge for Japanese economy. It can be said that it is the important strategy for growth of Fukuoka City to continue to strengthen the relationship with Asia and the world by generating a higher “added value” while taking advantage of geographic proximity and the speed of Hakata port.